It didn’t take a Legionella outbreak for Mayo Clinic to implement a Water Management Program. Facility management and infection prevention specialists at the storied medical clinic took a proactive water management approach to their 150-year old campus that had old plumbing and design issues. The Mayo Clinic engaged Phigenics to facilitate the development of a defensible and comprehensive Water Management Program appropriate for the facility’s age and complexity. The Mayo Clinic program was built using the principles of Hazard Analysis and Critical Control Point (HACCP), which is an evidence-based approach to controlling hazards and hazardous conditions. HACCP principles serve as the foundation for the leading water safety management program safety guidance documents: ASHRAE Standard 188, the Center for Disease Control and Prevention (CDC) Toolkit, the World Health Organization (WHO) Water Safety Plan, Centers for Medicare and Medicaid Services (CMS) 17-30, Veterans Health Administration (VHA) Directive 1061, and NSF International Standard 444 (in development). For purposes of this case study, the HACCP process is being summarized; for more details, you can find the full peer-reviewed article here: Infection Control and Hospital Epidemiology. The Mayo Clinic is a world-renowned healthcare facility. It has a main campus in Rochester, Minnesota and two satellite sites in Arizona and Florida. The Mayo Clinic Health System has 72 locations in Minnesota and Iowa, with 1,000 physicians and 14,000 allied health staff. Patients from all walks of life and around the world travel there for treatment, and within the United States, it is on the leading edge of experimental treatments and difficult cases. Al Kubly is a Section Head in Facilities Operations for the Mayo Clinic, Rochester, MN. Mayo Clinic, Rochester has a maintenance staff of 234 serving 14.7 million square feet throughout 105 buildings, including two large hospitals, research facilities, classrooms, and laboratories. The Mayo Clinic is 150 years old and by 2007, its age was starting to make itself known. The team established a scope of work and went to leadership for project approval and funding. They engaged Phigenics as a Legionella consultant and Legionella testing company to help them develop and implement a comprehensive and sustainable Water Management Program. After approval, the planning team assembled several working groups within the hospital and outpatient practices in conjunction with specialists from infection control and industrial hygiene. These working groups are comprised of maintenance technicians, supervisors and mechanical engineers who would work through the processes for hazard control. Next, they created an oversight team with a discipline for everyone involved. In addition to in-house personnel, the Water Management Team included consultants from Phigenics. This team would be in charge of monitoring and supporting progress, clearing a path for hazard control activities, and advancing improvements. It also worked as a liaison with administration and ensured teams were communicating and documenting their work correctly. Ultimately, the program would cover 26 buildings and 7,500,000 square feet, so good leadership was important. After assembling a Water Management Team and developing program goals, the next step is to describe how water is processed and used in the facility. To accomplish these tasks, the Mayo Clinic created process flow diagrams showing the processing of water throughout each building with each processing step named and numbered. The team then performed a population-based risk assessment, which characterized areas with immunosuppressed patients as very high risk and non-patient areas, like waiting rooms, as low risk areas. The next step is to perform a systemic hazard analysis. 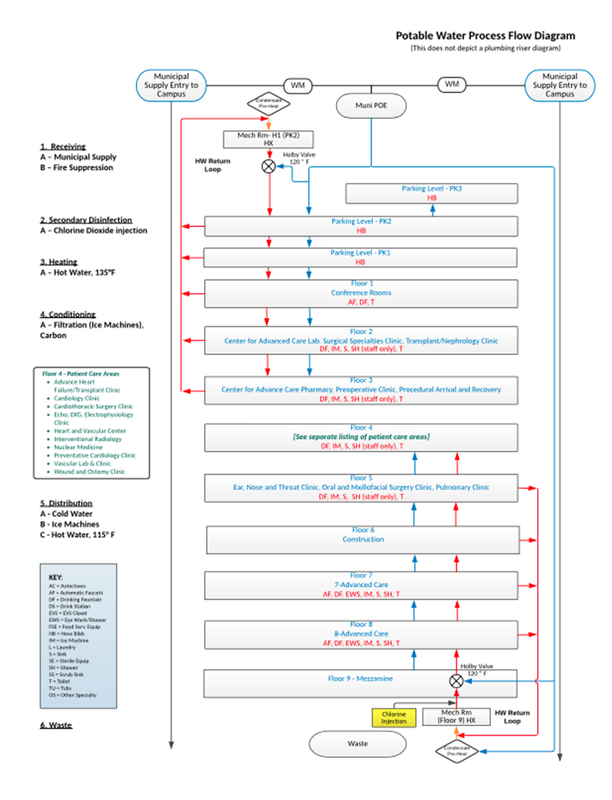 For this step, the team reviewed the flow diagrams carefully to identify hazards, characterize risks as significant or not, and determine if additional hazard control was needed. The Mayo Clinic Water Management Team identified seven areas as “control locations”. To control the hazards in these locations, team members developed control limits, chose monitoring methods, and set corrective actions in advance. For example, the hot water distribution to sinks/showers/sprayers needed to have between 0.2 and 1 ppm of free residual chlorine continuously. To confirm that this was the case, the chlorine added was automatically monitored continuously and technicians tested samples from distal sites with a DPD chlorine test every week. All this data was documented in online logs. If the data indicated that levels at distal sites were out of spec, facilities operation would flush the system until free residual chlorine was in range, then added an additional three minutes of flushing. Similar procedures were put in place for six other areas, including ice machines, water heaters, and a decorative fountain. All of this information was documented and accessible to all team members in Mayo Clinic’s phiAnalytics Water Management Program website. The final two steps of any Water Management Program are verification and validation. Verification means confirming and documenting that the program is being implemented as designed. For Mayo, the program is verified through online logs, oversight from the team, and quarterly check-in meetings. Establishing a Water Management Program provides a means to respond in a coordinated manner should an event occur. The Mayo Clinic has never had a Legionella outbreak. This framework allows them to respond quickly to get a situation under control quickly and prove that they had done all in their power to prevent it in the first place. Validation bears this out. The Mayo Clinic established sample collection procedures and culture methods to detect and enumerate Legionella, heterotrophic aerobic bacteria, total coliforms, Escherichia coli, Pseudomonas spp., Pseudomonas aeruginosa, and Mycobacterium (nontuberculosis). The polymerase chain reaction (PCR) for the Legionella genus was also performed. Out of 1,010 building water samples analyzed by culture at Mayo, Legionella was detected in only 2.1%. This is lower than the arbitrary target of 10% positive, and far lower than the 30% positivity criterion sometimes advocated as acceptable. During the study conducted by Mayo and Phigenics, there were two presumptive nosocomial L. pneumophila pneumonia cases detected at the clinic. However, no matching Legionella were detected in the potable water system or in patient hospital rooms after extensive independent environment investigations. The Water Management Team at Mayo Clinic started by looking for corrosion. They quickly addressed the problems related to old plumbing and ended up building a defensible, comprehensive, and sustainable Water Management Program. And, the team’s progress did not stop there. After putting systems in place for known hazards, the team was able to look at new opportunities to control pathogens. It investigated the small number of positive samples and began putting solutions in place for those. The goal is continuous improvement— a good fit for a clinic that’s always been on the cutting edge. © 2018 Phigenics. All rights reserved.